The Standard Missile-6 (SM-6)—also known as the RIM-174—retains the Standard Missile airframe and propulsion elements and incorporates the advanced signal processing and guidance control capabilities of the Advanced Medium-Range Air-to-Air Missile (AMRAAM). It is the latest addition to the Standard Missile family of fleet air defense missiles and provides Joint Force and Strike Force Commanders fleet air defense against fixed- and rotary-wing aircraft, unmanned aerial vehicles, and land-attack anti-ship cruise missiles in flight. The cost to obtain and maintain the SM-6 is also comparatively lower, allowing more defensive interceptors to be employed in the battlespace, enhancing the U.S. Navy’s fleet air defense capability against numerous airborne threats. The SM-6 is vital to the U.S. Navy’s Naval Integrated Fire Control—Counter Air (NIFC-CA) and provides surface vessels with increased battlespace protection against over-the-horizon anti-warfare threats. Retaining the Standard Missile legacy, the SM-6’s operational modes include semi-active homing and active homing to provide highly accurate target engagement. The SM-6 is vertically launched from a MK 41 VLS canister and is compatible with existing Aegis cruisers and destroyers. The missile interceptor receives midcourse flight control from the Aegis Combat System via the ship’s radar. Terminal flight control is autonomous via the missile’s active seeker or supported by the Aegis Combat System via the ship’s illuminator. Dual-Mission Capability The SM-6 has dual-mission capability, meaning it can defend against both cruise and ballistic missile threats. This capability is called SM-6 Dual I and is designed to intercept short-range theater ballistic missiles in the terminal phase of their trajectory. 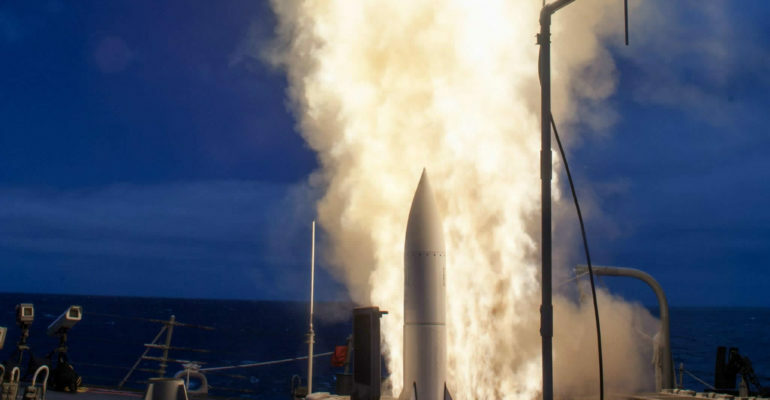 SM-6 Dual I adds a critical layer to the ballistic missile defense network of the U.S. Navy. In 2015, the SM-6 Dual I was tested three times and successfully demonstrated its Sea-Based Terminal role (SBT) against ballistic missiles as well as its Air Warfare capability. Similar to its precursor—the SM-2—the SM-6 also has limited offensive capabilities, and, when equipped with GPS, can carry out strikes on land and sea targets at a range of 200 miles. This new anti-ship capability is aimed at countering the surface strike threat posed by Chinese naval vessels with long-range anti-ship cruise missiles and would force them to stand off at ranges more favorable to U.S. aircraft carriers. SM-6 Block I The Block I has a Dual-Mode Seeker (Active and Semi-Active), a solid rocket booster, and dual thrust solid rocket motors. In 2013, the SM-6 Block I reached Initial Operating Capability when it was deployed aboard U.S. Aegis Destroyer the USS Kidd (DDG-100). During a test intercept in June 2014, the SM-6 Block I—fired from the USS John Paul Jones (DDG 53)—conducted the longest surface-to-air engagement in naval history. In 2015, the Block I carried out two successful intercepts, both of which involved cruise missile targets that were using electronic attacks against either the SM-6 missile or the Aegis shipboard radar. In February 2016, the two SM-6 Block I missiles successfully intercepted two cruise missile targets simultaneously. SM-6 Block IA This SM-6 configuration is designed to address hardware and software improvements and advanced threats. In November 2014, the Block IA successfully intercepted a subsonic cruise missile over land, marking the second successful flight test of the SM-6 variant. This SM-6 variant was again successfully tested in June 2017 during a land-based test at White Sands Missile Range in New Mexico. The successful test advanced the missile to the sea-based testing phase, possibly paving the way for low-rate production by the end of the year. SM-6 Dual I The Dual I is designed to counter ballistic missiles in the terminal phase of their trajectory as well as cruise missiles and other air breathing threats. Dual I upgrades include a more powerful processor that runs a more sophisticated targeting software that allows the SM-6 Dual I to identify, track, and intercept targets descending from the upper atmosphere at high velocity. During an intercept test in July 2015, the SM-6 Dual I demonstrated its dual-mission capability when it successfully intercepted a short-range ballistic missile target, in addition to two different kinds of cruise missile targets. In FY16, the Navy successfully demonstrated the maximum range Key Performance Parameter (KPP) and the launch availability Key System Attribute during SM-6 BLK I FOT&E and Aegis Baseline 9 operational testing. The Pentagon’s 2017 budget includes a $2.9 billion request for the SM-6, which Defense Department officials recently revealed will be gaining a supersonic anti-ship capability. This SM-6 upgrade was discussed by Secretary of Defense Ash Carter, who stated that, “We’re modifying the SM-6 so that in addition to missile defense, it can also target enemy ships at sea at very long ranges.” The missile first engaged a surface target in 2016 during a test demonstration. The initial deployment of the SM-6—called Increment 1—is scheduled to begin in 2016, to be followed by a subsequent deployment—called Increment 2—in 2018, at which time the SM-6 is expected to reach Full Operational Status. In January 2017, the SM-6 was approved by Congress for foreign sales to several international customers. As of June 2017, a total of 300 SM-6 missiles have been delivered by Raytheon.